Accles & Shelvoke Ltd have introduced a new device for measuring the stunning performance of their CASH® stunning tools. The all new CASH® Captive Bolt Stun Check by Accles & Shelvoke measures the precise velocity of the captive bolt of their range of CASH® penetrative stunning tools. Animal welfare concerns and legislations around animal slaughter, especially in Europe and North America, demand that the stunning equipment are regularly checked to ensure their compliance. The new stun check device measures the precise velocity of the captive bolt within specified tolerances. The check ensures that the stunning tools are working efficiently and effectively every time, and are compliant with the legislations. It is important for stunning tools to be checked regularly and comply with welfare standards in order to effectively remove pain and distress, where possible, from slaughter procedures. The legislations around the use of stunning tools are improving all the time, and we want to assure all our customers that our tools are compliant. 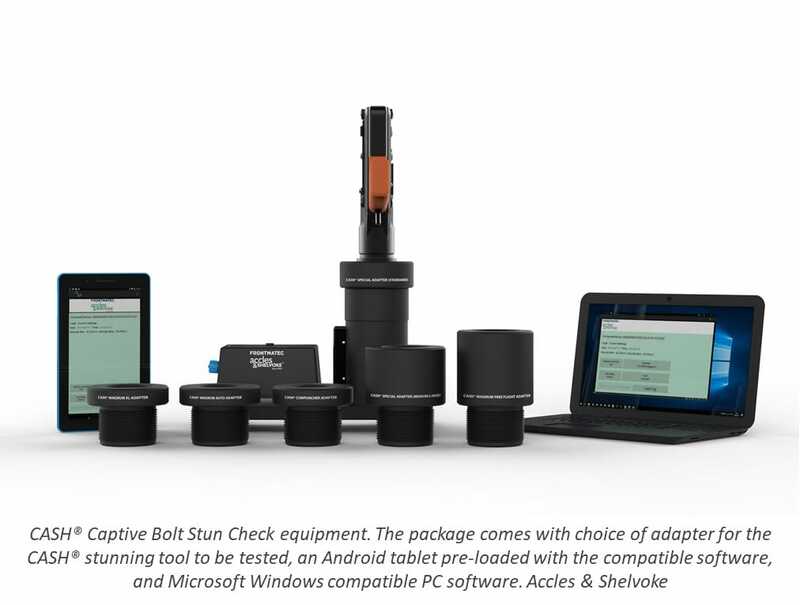 The new stun check device supports all our existing penetrative stunning tools range and produces measurable data for the requirements of an animal welfare audit. The CASH® Captive Bolt Stun Check comes with a choice of adapter for the CASH® stunning tool to be tested, and is pre-programmed to be used straight out of the box. Additional adapters are available for users with more than one CASH® stunning tool. The device is designed to be used wirelessly via Bluetooth with a tablet and PC, and is provided with an Android tablet pre-loaded with the compatible software and Microsoft Windows compatible PC software; both pre-configured for the CASH® Stunning Tool of the user’s choice. The stun check measures the upper and lower velocity limits of captive bolt. Besides record keeping for audit, the results also indicate to the user if the tool needs replacement parts or service. The test results include name and serial number of the tool cartridge specifications, operator name, date and time of the test etc. to produce a comprehensive data for audit, which can be saved and shared in MS Excel spreadsheet format.